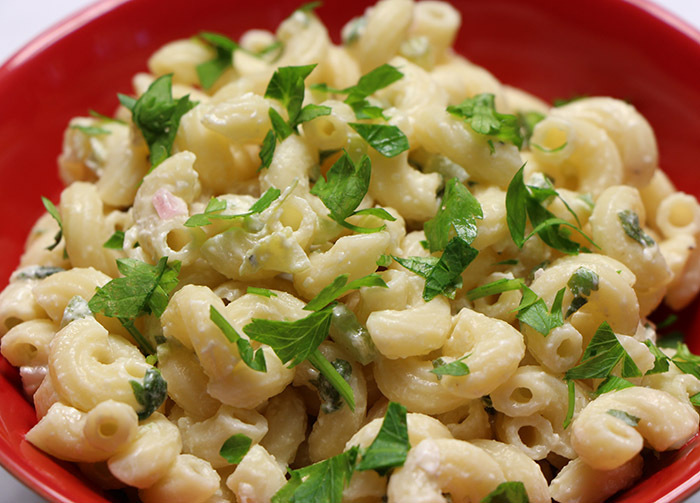 This is the quintessential tangy macaroni salad recipe for your summer bbq. Tangy and crunchy. This salad is destined to be part of your bbq arsenal. Don’t rinse the pasta after boiling-the starch on the pasta will help the dressing adhere to the pasta! As the water for the pasta is coming up to a boil (make sure the cooking water is seasoned properly-2-3 tablespoons of kosher salt for every quart of water) place the remaining ingredients in a large mixing bowl and stir well to combine. Add the pasta to the water once it has come to a boil. Cook as per the directions on the box. When the pasta is done cooking, drain the pasta but do not rinse! Let pasta drain for 2-3 minutes. Add the hot pasta to the dressing and stir to combine thoroughly. Taste and adjust seasoning if needed with salt and pepper. Let cool on the counter and refrigerate for an hour before serving. *Soak the onion in an ice bath (use a sieve) for 5 minutes before adding to the dressing. This step will remove that bite that raw red onions often have!